• A trigger switch poses a challenge: How do you keep the blamed thing running without holding the trigger? • Some routers—older Bosch models, for example—have gravity-dependent depth-adjustment mechanisms; loosen the set clamp and you can pop the motor right out of its base. With the machine hung upside down, this is trouble. Loosen the clamp to alter the depth of cut and the motor falls right out. Surprise! • A lot of Sears routers have exposed fans that collect debris. The debris naturally can damage the fan and, consequently, the motor. A switched outlet strip can be screw ed to the underside of the tabletop or to a leg. Such strips often have two or three outlets controlled by a switch, plus one or two that are always hot. 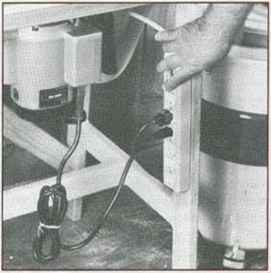 Plug the router and dust collector into the switched outlets, and plug a worklight into the unswitched outlet. break OFF tab to separate tme outlets. this outlet-" controlled by switch. Put some power in that router table. Yes, a Killer Router is nice, but unless it's cordless, it needs some 110. You can tack the end of an extension cord to the bottom of the tabletop. Plug in the router, and use the switch the manufacturer gave it. Not elegant, but direct. Until you get your fill of fumbling under the table for the switch. Then you'll think about electrifying your router table. To start, get some electrical supplies. You'll need a couple of receptacle boxes, a 20-amp duplex receptacle, a 20-amp single-pole switch, a few feet of type NM cable (12/2 with ground), a few-wire nuts, a receptacle plate, a switch plate, a length of type SJT appliance cable (again, 12/2 with ground), and a ground plug rated at 20 amps. 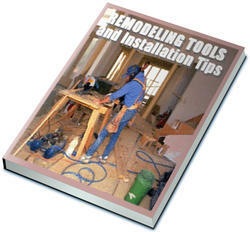 Begin by attaching the receptacle boxes to the router table. Placc the "outlet" box close to the router, and the "switch" box where you can find it without fumbling, without looking. Run the type N\1 cable from one box to the other. Install the plug on one end of the appliance cable, and insert the other end into the switch box. Wire the switch following the wiring diagram, and install the switch plate. 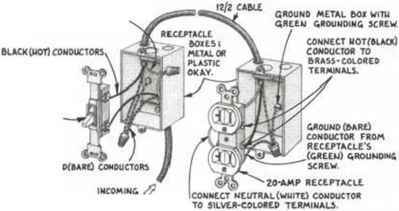 Likewise, wire the receptacle and install the receptacle plate. Plug everything in. and you're ready logo. 20 -amp single pole swncu ground(bare) conductors gr0un0 metal box witu qreeu grounding screw. connect motfblacx) conouctor to brass-colored terminals. incoming /? power ground (bare) conductor from receptacle's (greew) grounding screw. 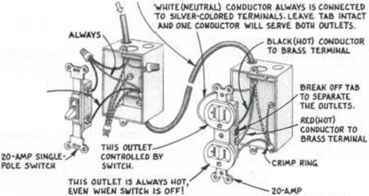 •20-amp receptacle connect neutral (white) conductor to silver-colored terminals. red(uot) conductor carries current to outlet tuat's always uot. black (uot) conductor carries current to jwttch-controued outlet. 12/3 with gbol/wo type nm cable vmite(neutral) conductor always is connected to sjlver-colored terminals. leave tab intact and one conductor will serve both outlets. this outlet 13 always mot,' even when switch is off! 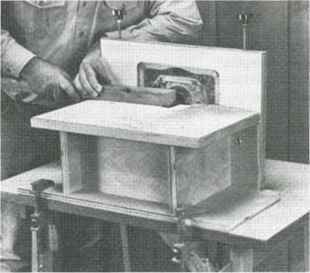 Btffliis«- the groove becomes the rabbet into which the mounting plate sets, it is vital that the depth of the groove perfectly match the plate thickness. 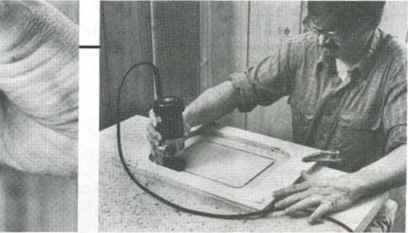 To ensure this, use the plate to set the router's depth of cut. Cutting the groove for the mounting plate isn't too big a job for a laminate trimmer. In fact, the trimmer s smaller baseplate minimizes the size of template needed to guide the ait. 5. If the test demonstrates the template is sized correctly, position it on the tabletop, clamp it securely, and use the router to groove the tabletop. After the waste is cut out. 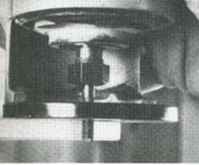 the groove becomes the rabbet into which the mounting plate is set. 6. Cut out the waste, completing the opening. Use a saber saw, and guide it along the inner edge of the groove. To stan the cut, drill a pilot hole for the saber saw blade. When you are done, the plate should just fit. After all. you've tested it. Make sure you have reasonably beefy screws holding the router to the mounting plate. Many older routers had only three #8-32 screws holding the baseplate on. That was fine for the use intended, but when you hang the router from the plate, you're better off to either tap those holes out to a bigger size or drill and tap new holes in your base. The Poner-Cable we use has four Vfo-inch-18 screws holding it to the plate. By all means, use flathead screws and countersink them so that they are just barely rcccssed. (Recessing too much not only weakens the plate, it creates a collection point for chips that will invariably catch your work and ruin your cut, if not your fingers.) Flatheacls give the Ix-st load-spreading grip and are least likely to crack the plate and pull through. Don't use roundhead screws; they require a flat-bottomed counterbore that can seriously compromise the strength of the plate. The counterbores collect a lot of chips, too. The situation most likely to test the strength of the plate and mountings is when you make a mistake in feed direction. A 3-horsepowcr router sucking a ><»-inch piece of oak into a '/2-inch spacc between the cutter and the fence can create an amazing amount of pressure. If your router is securely mounted, the fence should give enough to allow the stock to be plucked from your fingers and thrown across the shop. If the router mounts give first, you could end up with an angry router coming out from under the table after you.